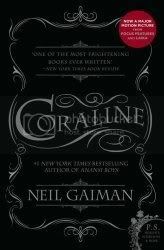 A quick little read, Coraline is Neil Gaiman's first book for children. The book opens with Coraline's family moving into a new home. The house itself is very large, and has been separated into several flats, and in Coraline's she discovers a door that leads to a brick wall. Being an inquisitive child, she's curious about what lies on the other side of the door, but accepts that it's probably just the other side of the house that was closed off to make the flats. How wrong she is. It turns out that the door actually leads to her other house, identical in almost every way to her real house. In the other house, she discovers her other mother and other father, who are identical to her real mother and real father except for the fact that in place of their eyes, they have black buttons sewn in place. Everything in her other house is perfect; the food is better, and her other mother is willing to give her anything she wants. But deep down, Coraline realizes that this is wrong, that if she can have anything her heart desires, anything at all, but without earning it, then it means nothing, and she would be living a lie. It's a creepy little book, and in typical Gaiman fashion, he gives us very little background on what is happening, but writes the story in such a way that you just accept what is happening in the story. The stark illustrations by Dave McKean really add to the ambiance of the story. Not challenging, but thought provoking all the same. I think I will watch the movie before I read the book so I have a chance of liking the movie. Sounds interesting.